The 2009 BMW Z4 marks the second generation of the Z4 name and third of this recent line of two-seat roadsters James Bond debuted in his 1996 Z3. The 2009 Z4 is a totally new car, apart from the lower output of the two engines and a few miscellaneous pieces. 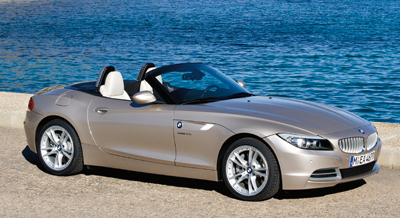 The 2009 Z4 sports a retractable hard top, a departure from any previous two-seat BMW. The retractable hard top replaces the roadster and coupe versions of previous-generation (pre-2009) Z4 models with one car. The hard top retracts for the same open-air driving of a convertible, but closes with the press of a button to provide the advantages of better security, rigidity, rearward visibility, quiet and weather control of a coupe. The Z4 offers the driving character you expect from BMW and it will be familiar to any fan of the marquee. As with other cars getting bigger and laden with more luxury and features, the higher-optioned Z4s tend to feel more like Grand Touring machines than sports cars. In terms of pure sports car, we liked the sDrive30i with sport package. The performance and feel of balanced precision is there in every Z4, and the sDrive35i with dual-clutch gearbox gets close to the previous M Roadster as a track day tool. While some will choose a Z4 based solely on the badge and others solely on style, they will over time learn the real reasons, both objective and emotional, behind the car and why they want to keep it. Others will appreciate the performance and technology without regard to style, and yet others will shop merely because they've been waiting for a folding hardtop roadster from Munich. BMW accurately point out that the Z4 sDrive35i is about the same size and offers performance close to the Z8 of early this century, and it does so for about half the price. The Z4 is also far more practical, and yes, there is such a thing as a practical roadster. The Z4 competes primarily with the Audi TT, Mercedes-Benz SLK and Porsche Boxster; secondary consideration may go to the Nissan 350Z roadster, Infiniti G37, or Lotus Elise relative to your position on the luxury-sports continuum. The 2009 Z4 is offered in two models, the sDrive30i and sDrive35i. In current BMW nomenclature, sDrive refers to rear-wheel drive. However, there are no xDrive (all-wheel-drive) Z4s and no M model has been announced. The Z4 sDrive30i ($45,750) comes with a 255-hp 3.0-liter inline six-cylinder engine and six-speed manual transmission; a six-speed sport automatic with shift paddles is optional ($1,325). It's delivered with faux leather leatherette upholstery, manual climate control, power retractable hardtop, heated power mirrors and rear window, six-way manual bucket seats, tilt/telescoping steering wheel, rain-sensing wipers, power windows and locks, trip computer and adaptive bi-Xenon headlamps. Options unique to the sDrive 30i are brushed aluminum or ash wood trim ($500) and Kansas leather upholstery ($1,250) from the sDrive35i. The Z4 sDrive35i ($51,650) uses a 300-hp 3.0-liter inline six, though it is a different engine than the 30i and employs twin turbochargers; a six-speed manual gearbox is standard and a seven-speed dual-clutch automated manual optional ($1,525). Other mechanical upgrades include larger brakes and wider rear tires and wheels. Cabin upgrades include standard leather upholstery, brushed aluminum trim or ash wood, and automatic dual-zone climate control. Kansas leather upholstery on the dash, visors, door sills ($1,350) is optional, along with a 19-inch wheel upgrade to the Sport package ($1,200). Options for both Z4 models include navigation ($2,100); Comfort Access ($500); Park Distance Control ($750); HD radio; satellite radio w/1-year sub ($595); smartphone integration ($150); anti-theft alarm ($400); metallic paint ($550). The Cold Weather package ($1,000) includes heated steering wheel and seats, storage pack, through-loading system, headlight washers. The Premium package includes auto-dimming mirrors, gate opener, power seats with lumbar and driver memory, ambient light package, BMW assist, leather on 30i. Premium Sound ($2,000) adds six-disc DVD changer, hi-fi sound system, iPod/USB adapter. Sport adds 18-inch alloy wheels and run-flat performance tires, Adaptive M suspension, sport seats; 19-inch wheels are also available. Exclusive Ivory white Nappay leather is available, along with anthracite wood trim. Standard safety features include frontal airbags, head/thorax side airbags in the seats, active knee protection, roll hoops, and electronic stability, traction and braking controls, tire pressure monitors. The only option that might be considered safety related is the Park Distance Control. The all-new 2009 Z4 is built on the same wheelbase as its predecessor but adds length, most of it at the rear. The lines are slightly softer on this generation, aiming for the happy medium between the Z3's mild, more feminine curves and the last Z4's more masculine, aggressive flame surfacing and sharp stub of a tail. This latest Z4 is about six inches longer than the previous Z4 due to the retractable hard top mechanism. Classic roadster proportions give the Z4 a long hood and short decklid, shoulders over the wheel arches and tapers in three axes. The creases begun at the inner edge of the headlight housings roll over the front fenders and lead back to bisect the door handle, while an opposite lower sweep started at the front bumper curves upward to the rear wheels. In side view it looks like a French curve over each wheel, the forward one twice the length of the rear, and from the driver's perch the hood seems to rise from the windshield base before falling off forward. We think it looks better with the top down but it's still relatively sleek top-up and has a similar closed profile to the big Mercedes SLR. Gills behind the front wheel carry the substantial badge and the side signal repeater is now behind an opaque panel in the gill; the BMW propeller logo is still here, but no longer serves to disguise the signal. A variety of wheel sizes and finishes are offered, and while the Z4 is light and well-suspended enough that even 19-inch wheels can deliver decent ride quality they might not work well with poor infrastructure (rough roads), and some wheel styles will require more cleaning effort. From dead-on at either end the top-dropped Z4 has strong resemblance to a scaled-down version of the 6 series and its roadster precursor the Z8. Sections of the taillights look like horizontal light tubes and appear to ramp up like theater lights when the lights are switched on. Adaptive brake lights deliver more red light when you hit the brake pedal hard than when merely slowing mildly. The center brake light is midway between rear window and tail on the trunk lid where it will not interfere with rear vision but will be covered up by an inch of snow. A single side twin-exhaust outlet signals a 30i where the 35i uses a single outlet on each side, a la Z8. Although front-end shaping is the same, with BMW's trademark corona (programmable) daytime running lights for instant identification, trim varies by model. The 30i has black vanes in its grille and a silver slash across the outer lower grilles, where the 35i has matte silver grille vanes and perimeter frames for the outer grilles. While the Z4 is close to the ground the front overhang is shorter than many and not prone to scraping at every speed bump or mild driveway. The Z4 is longer than the Audi TT and Mercedes-Benz SLK, shorter than the Boxster, but the difference is a few inches. In height and width, they are much closer so exterior dimensions should not factor in purchase decisions. The Z4 is now built in Regensburg, Germany. In BMW fashion, many systems on the Z4 have been proven in other recent BMW models, including the higher-output engine, transmissions, and suspension design. The Z4 cabin is immediately familiar to any BMW owner, with many of the Munich builder's hallmarks: simple white-on-black analog instrumentation, sweeping driver-centric lines, functional controls and a high level of fit and finish (apart from the molding seams on the map pockets). In a generally evolutionary upgrade you notice first that, yes, it's definitely a BMW roadster, second, that iDrive has been revamped and the parking brake lever is gone, and lastly, it feels just like the old coupe with the top up. The Z4 30i comes with leatherette upholstery, but that is available only in black which might not be best in sunny areas where you're likely to park the car open. Order leather (designed for a convertible climate), or get the 35i, and the palette increases to four colors and only one of them is dark; on 35i versions you can even extend the leather coverage for the ultimate in premium feel. The low-gloss brushed aluminum or ash wood trim (which does reflect a bit of glare top-down) of the 35i may be added to the 30i. There is plenty of space for two people in the Z4, the head and legroom about what you find in a full-size SUV. Standard manual seats and tilt/telescoping steering column provide enough adjustment to suit many driver sizes; slender types will appreciate the side bolsters on the seats and larger bodies will be framed as much by the door and console. While they may not look like thick armchairs the seats offer excellent support over multi-hour drives; the sport seats are a bit more confining for wide girth and superb for a spirited drive. The driver's footwell is large enough for size-13 shoes to comfortably operate three well-positioned pedals and a good dead pedal to rest/brace your left foot on. Inside storage has long been the bane of roadsters so particular attention was paid to that. The door pocket walls tilt out for access, and in doing so make excellent coin catchers for the change flying out your pants pocket at the first hard bend. A bin ahead of the shifter has good containment properties and there's a cubby atop the dash on cars without navigation. Other storage areas are behind the seats, and there is a pass-through door available for carrying skis or golf clubs. The armrest lid conceals two cupholders and that lid stays up on its own and clears even lanky elbows, and a third cupholder clips in to the right side of the console right about where the passenger's left knee rests. Cupholders are not the priority here, driving is. The multifunction steering wheel is thick enough to feel good and thin enough to receive all the feedback the suspension delivers. Ahead of it are large speed and engine rev gauges, with smaller fuel and oil temperature (more useful than coolant temperature) in the bottom. Digital displays in the center handle outside temperature, mileage, trip data, and on automatics, gear indication. Outward visibility is good, and a major improvement with the top up. The windshield curves across the top and the pillars are no impediment, but taller drivers will have to look around the inside mirror on up-and-down winding mountain roads. The three-quarter view right behind the seats is much better because the folding top added two small windows. Even the 8.8-inch stowable navigation display (1280x480p) was easy to read in direct sunlight, polarized sunglasses or not. Climate control is manual on 30i and automatic dual-zone on 35i with an automatic recirculation mode that senses air contaminants. With the heated seats and steering wheel option the close-the-top temperature goes down 10 degrees or more. Slide the control wheel at the center dash vents from warm to cool and the response is immediate. This happens with most of the controls. There is no need to hold the trip odo button to reset it, and some are designed as multifunctional with one result from a quick tap and another from depressing and holding. Audio options include HD radio, satellite radio, glovebox-mounted six-disc DVD changer, iPod and USB ports and a hi-fi system with 14 speakers driven by an amplifier capable of delivering 650 watts. On navigation cars much audio control is done through iDrive but common requests can be handled by steering wheel buttons as well. On cars with iDrive there is an 80GB hard-drive that has 15GB allotted to music storage, and it will contain CD contents for you. The new Z4 gets the next generation of iDrive (with navigation) and it is improved as much as anything on the car. Buttons have been added to the controller to speed access and operation is much more intuitive while maintaining the myriad functions. It might not be the best such system in modern automobiles but should put an end to the criticism of earlier iDrive. Our only complaint is that the controller is located between the shift lever and the armrest and on gear changes we frequently bumped the controller, often executing a command or changing the radio station in the process. Automatics with paddle shifters won't have this problem, nor manual non-navigation cars. The parking brake is electrically operated by a switch behind the shifter, and it does get hot in sunshine, even underway. Concerns about starting on a hill without a lever to work are addressed by the start-off assistant that keeps the brakes applied momentarily while you engage the clutch and throttle. Switching for the suspension and transmission, where applicable, is to the left of the shifter so you're hands never have to travel far. On the 35i the optional dual-clutch transmission has a shift lever shared by some other new BMW products that's a bit unconventional and looks like a cross between a video-game controller and a beer tap. Neutral is the default position and park a pushbutton; push the lever forward to go backward and vice-versa, and in manual mode, it shifts like a racecar with downshifts forward and upshifts back, allowing g-forces to assist the driver with shifting. The top opens and closes in 20 seconds without any fear it will bump you on the head and once up felt just like a coupe in terms of noise; the headliner is off-white to enhance spaciousness. Raising all four windows (use the master on the driver's door) allows conversation at 75 mph top down, and most window-down wind noise comes from the area around the seatbelts. There is no wind-blocker panel for between the headrests specified in early option sheets though we have seen photos and it may become available through your dealer. Cargo room is about average for the class, but better with the top up (10.9 cubic feet versus 6.4 using the DIN standard). On cars with Comfort Access you can, through the key fob, lift the stowed roof out of the way for easier loading and unloading. BMW labels this Z4 an expression of joy. We usually just smile, and the Z4 may well bring a smile to your face, so we'll go along for now. While the retractable top and added features have nudged it a bit closer to grand touring car than sports car it is still clearly aimed at those who enjoy driving. Both inline sixes are smooth as an America's Cup boat hull right to redline, deliver a sonorous note, are 3 liters in capacity and there ends most similarity. The 30i engine is a very light, modern, rev-happy unit that brings 255 horsepower at 6600 rpm and 220 lb-ft of torque at 2600 rpm; it has more than enough power for any road and delivers it in linear fashion, output rising commensurate with revs. This package is rated 19/28 mpg with the manual and 19/29 for automatics, numbers we easily met or exceeded. Although also a 3-liter the 35i's is a different engine altogether. It uses two very small turbochargers to boost maximum horsepower to 300 at just 5800 rpm and more noticeably, up torque by 80 lb-ft to 300 from just 1400 rpm through 5000. The extra muscle gets the 210-pound-heavier 35i to 60 a half-second quicker than the 30i and delivers plenty of power for street and track alike. It will wind to 7000 rpm but there's really no point with that abundance of torque, and while it's a superb engine it doesn't offer the emotional happiness the 30i does. With a manual, EPA numbers are 18/25 and with the dual-clutch seven-speed 17/24. With decent aero drag numbers, small frontal area and an efficient driveline we managed almost 24 in a manual over some amusing roads and 38 mpg/72 mph on an 80-mile leg from 4000 feet elevation to 700. The primary competitors similarly have multiple engine offerings and similar mileage ratings. Mercedes SLK300 gets 228 hp and 221 lb-ft from its V6 with six-speed manual or seven-speed auto, but the SLK350 with 300 hp is automatic only. Porsche Boxster (about $800 more) brings 255 hp at a lofty 7100 rpm and 214 lb-ft of torque; the Boxster S, about $8000 above a Z4 35i, rates 310 and 266 respectively. Audi TT offers three engines starting from $10,000 less than a Z4 30i but the closest match is the TTS roadster ($1,800 above a Z4 30i) with a turbocharged four-cylinder of 265 hp and 258 lb-ft from 2500-5000 rpm, and despite all-wheel drive you might appreciate in inclement weather, the TTS is lighter than the Z4 30i. For the price of a fully loaded Z4 35i you could also contemplate an AMG SLK55 V8 or a lightly used recent Porsche 911. The six-speed manuals, both of them, offer soft, progressive clutch take-up for smooth starts whether crawling in traffic or weekend autocrossing. Shift action is light, short and semi-notchy, rather like there's a rubber-edged metal gate hiding under the shift boot. Shifts are quick, clean, and error-free. The 30i automatic is a conventional six-speed unit and goes about its business exactly as intended; it's not as quick as the manual but costs only in purchase price and not fuel economy. However, the big engine in the 35i gets an optional seven-speed dual-clutch automatic from the M3. Don't let the name confuse you: it does have clutches but they are all controlled by the car, the only coordination required is engaging D and pressing the gas. Around town you will feel like it has a momentary delay between when you press the accelerator from a stop and when the car starts moving; the actions behind this are also why it doesn't creep in gear as much as a conventional automatic. Pushbutton mode changes allow you to ratchet up the speed and intensity with which it shifts to the point it is faster than the manual and makes a milleseconds-long burp from the exhaust pipes as it rips through the gears. It's also smart, doing things like dropping gears automatically (rev-matching the downshifts) if you hit the brakes hard to go into a corner, but it will shy away from gear changes mid-corner so it doesn't upset the balance of the car. There is also a launch control mode for ultimate acceleration but read the owner's manual cautions on this before you take the steps and disappear in a wisp of tire haze. Since it has more power and weight, the 35i gets substantially larger brakes. Brake performance and feel is good across the range, and we had no brake issues at all charging downhill in 100-degree weather in a 30i; racers may opt for the 35i's bigger parts. The 35i also has wider rear wheels and tires to cope with the added weight and power. A $57,000 35i with sport package, dual-clutch gearbox and 19-inch wheels arguably makes the best track car in terms of outright performance, but we found the 30i ($49,000 with sport package) the sweeter ride on a winding road where the lighter weight is felt, reactions and response seem more linear, and the whole effect is more pure sports car than race car. Even on the standard run-flat tires (no spare) and optional sport package the Z4 rides commendably well. Part of this is good suspension tuning, part from the rigid structure it's mounted to, and part from the adaptive damping included in the sport package that allows for Normal, Sport, and Sport-plus settings. Steering is electromechanical but you'd never tell by how well it communicates what the front tires are doing. Unlike many sports cars that feel heavy steering is a requirement this is light around town, weights up nicely with cornering force and reminds us somewhat of the Honda S2000. It can't really match the surgical detail of the Porsche Boxster, but nothing at this price, short of a Lotus does. With a low center of gravity and near-perfect weight distribution with occupants, the Z4's handling is exemplary. You'd need something considerably lighter, more stiffly sprung, equipped with fatter or stickier tires to make notably faster progress. Like the Mazda RX-8 (a lighter two-door, four-seat, front-engine, rear-drive coupe), the Z4 is not only nicely balanced and goes where you point it, it does so with little drama and it's relatively easy to find where its limits are. Putting the top down doesn't change the behavior at all because it's the lightest such assembly in the industry (aluminum panels) and changes front/rear balance by 0.3 percent and it puts that weight closer to the ground. You could argue lowering the top costs some rigidity as the triangulation between windshield, floor, and trunk is gone, but there is no cowl shake and only the inside mirror vibrated a bit on poor road surfaces so characteristics don't change. The one thing you do have to get used to, depending on whether you're looking at the road or the hood, is what your brain might interpret as a momentary delay between when you turn the wheel and when the car rotates and changes direction. Since you sit so far from the front axle and adjacent the rear axle, steering input tends to send the hood off to one side before you feel the rear tires join the party and rotate the car. It's a sensation the more driver-forward Boxster and TT don't offer, and it's much more muted in the softer SLK. Among the competitors, the SLK also offers a folding hardtop, while the Audi TT and Porsche Boxster use folding cloth tops; they're perhaps not as quiet and sealed as a hardtop, and not as easy to see out of, but trunk space doesn't suffer as much when motoring top-down. The TTS has the foul-weather bonus of all-wheel drive and a nicely finished cabin, but not the same balance and precision finesse as the Z4. The Mercedes offers many similar amenities but is less a driver's car and more a small version of the SL luxury convertible. Porsche Boxster has even better driving precision and power of the 35i with the pilot engagement of the 30i, but its tariff can rise even faster than that of the Z4. The all-new 2009 BMW Z4 picks up right where the last generation left off, or as a more intimate, involving 6 Series cabrio. That it is a bit bigger and more luxurious doesn't indicate any loss of soul or enjoyment, and the folding hardtop offers the best of coupe and roadster forms with fewer of the drawbacks of either. We think it's the best sports car in this class short of the Porsche Boxster, and it can't switch between top-down roadster and hard top coupe the way the Z4 can. G.R. Whale filed this NewCarTestDrive report from Los Angeles. Head/hip/leg room, f: 39.1/na/42.2 in. Cargo volume: 10.9 cu. ft.